Congratulations are in order for Pete Markstone! 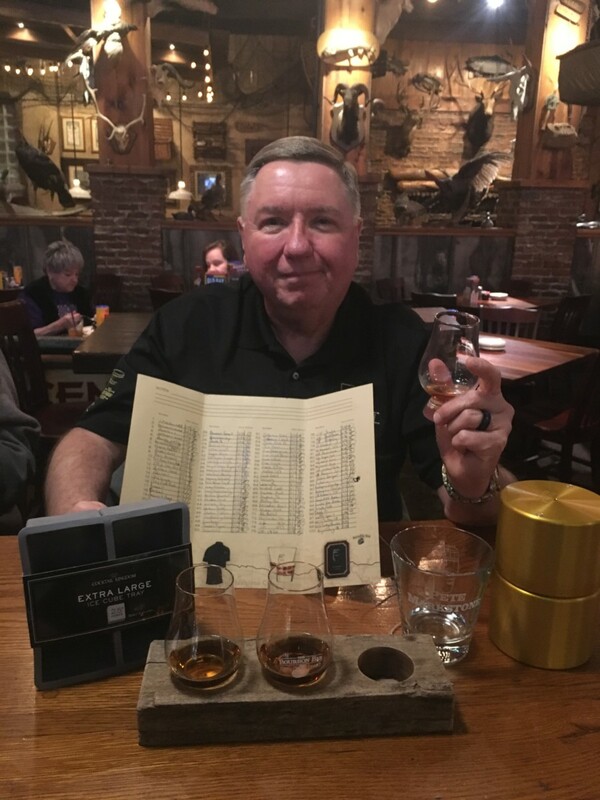 He has completed the Trapper’s Bourbon Bar Bourbon Hunt! He has tasted/drank 100 + bourbons and he is still counting! Anyone can join the trail as long as you are 21 years or older. Each participant receives prizes for every 25 bourbons tasted. Want to expand your knowledge or just love bourbon? Then come on down today and join the HUNT! We promise you won’t be sorry! Below are few words from the man himself! How did you hear about the Bourbon Hunt? Knew about Trapper’s for years, but found out about the Bourbon Bar and the Bourbon Hunt online. What started your love of Bourbon? Back in early fall, I was on a cruise with some friends. One of the bars on board the ship had a bourbon seminar which included tastings. I had never really tried a lot of bourbon but one of our friends was going to go and asked me to join. We tried several different bourbons and from that point on I was hooked. Is Bourbon tasting a new hobby of yours or was it prior to starting the HUNT? It has been since that day on that cruise ship. Blanton’s was my favorite that we tried on the ship and when we came back and I went looking for it in local stores. It was nowhere to be found. I discovered it was a very limited production and never stayed in a store long. In November my wife and I traveled to Florida by car. We stopped in liquor stores in every state along the way. None to be had. This caused me to become even more involved in the Hunt. What is your favorite Bourbon? Wow. That’s like asking a parent to pick their favorite child. I really like Woodford Reserve Double Oaked, Blanton’s Single Barrel and Henry McKenna 10 year Bottled In Bond. Also 1792 Small Batch, Russell’s Reserve and a few others. How long did it take your to complete the trail? I’m almost ashamed to admit it took me less than four months. Was it harder or easier than you thought it would be to get to 100? Way easier. My wife and I come here every Thursday night (barring weather, travel, etc.) and even came several other days when friends or family wanted to go on another night. What was your favorite part of the experience? I got to try out a large number of bourbons without going out and buying a whole bottle of something just to discover it does not appeal to me. Plus I got to try some bourbon’s that I would never spend the money to buy the bottle because they are ridiculously priced. On top of that, I made some new friends in the staff at Trapper’s. Shout out to Brandon Carter, Scott Snow, Gabe, Josh, Kaylie and Teresa! These people are what makes Trapper’s great! Are you going to continue the trail or take a break? Still going strong. Up to over 130 now. My wife has now started the Hunt! She intends to be the second person to finish the Hunt! We’ll be here for a while. Would you recommend The Hunt to his family and/or friends? Absolutely! I have brought my best friends and his wife to Trapper’s as well as my son and some of his friends. I recommend Trapper’s and The Bourbon Bar frequently. It’s not just the bourbon, the food is great as well! Well there you have it ladies and gentlemen! You heard it from the man himself. Don’t delay and come on down today to start THE HUNT! Happy Trails!